Offline content is available within the modules of your courses. The offline content is for offline viewing only; you cannot interact with course content directly, such as completing an assignment or viewing any submissions. The course content is downloaded as a zip file, which includes the HTML version of the course. In the HTML file, you can view assignment details, availability dates, and point values. Discussions and quizzes only include the description. All discussion replies (graded or ungraded) are considered submissions and must be viewed online. Additionally, you can view any embedded media files in the HTML file. If a link can only be accessed online, the link includes an external icon identifying the content as online only. Note: This can be turned off by course, and is only accessible if modules are used. 1. 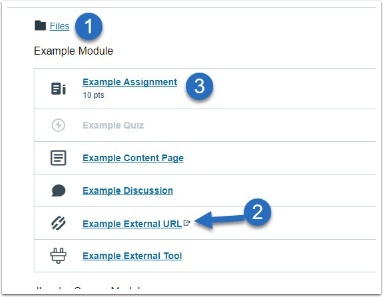 Open Modules from your Course Navigation. 2. You will see the “Export Course Content” as an option on the right-hand corner. Click on the “Export Course Content” button. 3. You will then see that your course is being downloaded. Note: Depending on the size of the course, this may take a few minutes. If you remain in the page until the download is complete, the file will download directly to your computer. If you leave the page, you'll receive an email notification when the course download is complete. You can use a link in the email to download the file. 4. The course will download to your computer as a zip file. 5. Once you locate the zip file, you want to double click on the file to open the file. Note PC users: In order to extract the folder, you need to click on the zip folder, then on “Extract”, and then “Extract All”. 6. Once the folder is extracted and open, you want to click on the index.html file. 7. The file will then open in your default browser. The offline download only has the content that was available at the time of download. In order to see new content, you will have to download the content each time. To view course files, click on the Files link. If any content can only be accessed online, the content link includes an external icon. To open the course content, click on the name.